Today i was having a coffee at my favourite icecream parlour Frolian on Malabia and Gorritti when I was told that Francis Ford Coppola has brought a gothic mansion across from there to be converted in a 5 star hotel for visiting Hollywood Celebrities. The price he was rumoured to have paid was 900 thousand american dollars. There seems to have been a huge increase in properties sold lately on that block of Gorritti fetching record prices in this area . Another sale was reported of 1.2million dollars for another property situated a few metres from Francis Coppolas place. I have predicted that this would happen since 2002 that Palermo Viejo would become one of the most expensive areas in Buenos Aires but very few beleived me then especially my family who considered this not a good area. For me Palermo Viejo is the soul of Buenos Aires and I still am in wonderment of the beautiful tree covered streets with their palo borrachos and jacarandas that make this city so uniquely special. I have rent apartments in buenos aires twice. I love that city, but I found that Palermo may be an extraordinary neighborhood but it is a turistic one, it does not represent the true spirit of Buenos Aires. 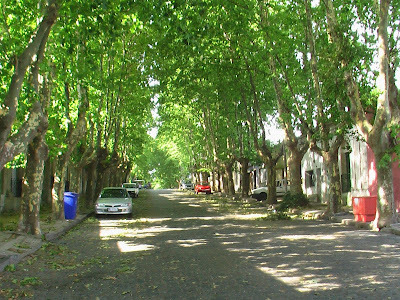 Areas like Villa del Parque, Devoto, Saavedra or Coghlan are not as spectacular as Palermo but there is were live the middle class of Buenos Aires, those who work everyday to keep Buenos Aires as great as it is.